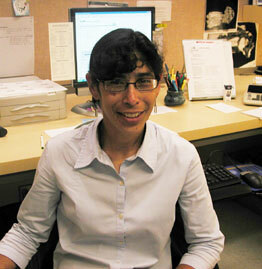 We would like to welcome Christine Mejia to UCMP! Chris will be working in the front office and will provide general support for our administrative needs. Chris comes to us from John F. Kennedy University School of Law in Pleasant Hill and we are delighted to have her on board. Many thanks and congratulations are due to both Colleen Whitney and Robin Walker as they “leave” UCMP and begin their careers as graduate students. 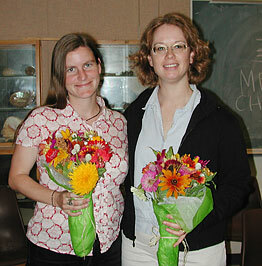 Colleen joined UCMP in 1999 working on special projects and eventually becoming the UCMP Webmaster. As such, she upgraded the site substantially, added new features such as the UCMP news, and Mystery Fossil. She has also modernized and integrated the UCMP databases and provided a web interface that provides easy access to specimen data for both the research and education communities. Colleen has been accepted into the Masters Program at the School of Information Management and Systems here on campus, but will maintain her connection with UCMP by continuing her work on the UCMP database and on the Paleontology Portal project.